These look a lot more complicated than they actually are! I used the buttercream frosting recipe that was posted on the Charlie Foundation site to decorate and hold the house together. I noted how much of the frosting I used at the bottom of the post so you can factor it into your calculations. 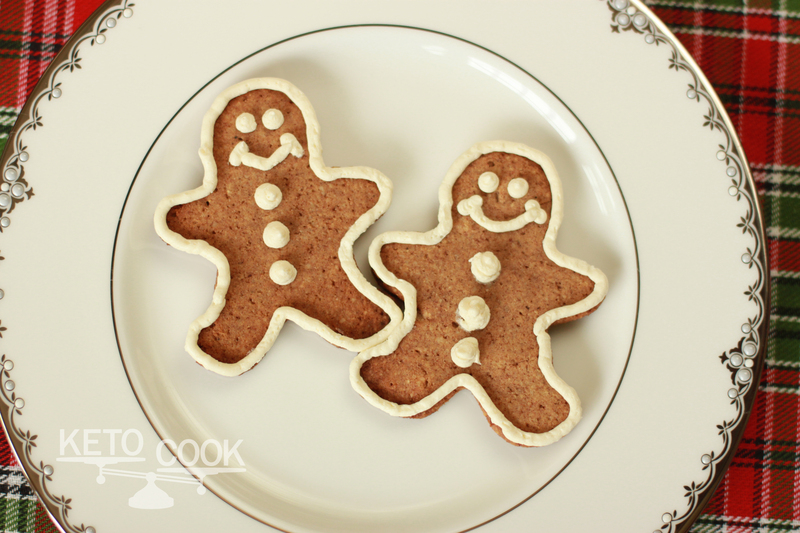 The gingerbread recipe has been added to the “standard snacks” and the “fat” categories in the ketocalculator. This way you are able to weigh the final product instead of working with the full recipe. This will work for the 2:1 ratio only! If you modify the recipe, do not use the cooked version in the ketocalc for your calculations. The buttercream frosting is also included in the ketocalculator. 2:1, 3:1 & 4:1 are the options to choose from and can also be found in the “fat” category and “standard snacks” section. The cookies are designed to be very strong and dry to hold up to building and decorating without crumbling. Cut back the baking time if they are too dry for your taste. Enjoy! Mix all of the ingredients together very well until the dough is even in color. Wrap the dough in plastic wrap, flatten it into a round disk shape and let it chill in the refrigerator for about 30 minutes. Roll the dough between two pieces of plastic wrap until it is about ¼ inch thick. Use a cookie cutter to cut the desired shapes. Re-roll the excess and cut more shapes until all the dough is used. Bake for 15- 20 minutes on a parchment paper lined baking sheet. Lager cookies will need a longer cooking time. Allow the cookies to cool. Once they are cool, you may decorate them with buttercream frosting. 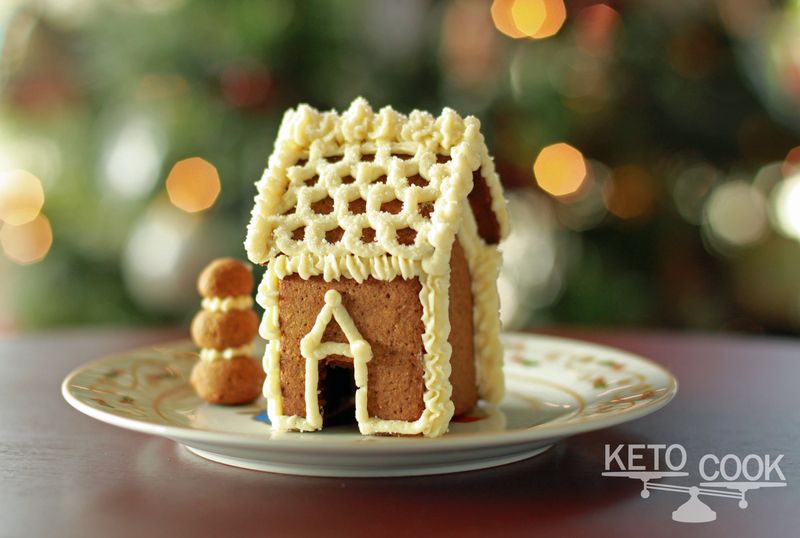 The gingerbread house measures about 2.5 inches wide by 3 inches high. If you do an Internet search for “mini gingerbread house template” you will find a variety of printable templates to guide you. I cut the pieces freehand with no template. They were not perfect, but the icing will help hide mistakes! The gingerbread house used about 25g of buttercream frosting to hold it together. Each gingerbread man used 3g of buttercream frosting for the decorations. Thank you for all of your wonderful recipes. We constantly use your site to make our keto meals and come up with ideas. Your help has assisted many families. You amaze me!!! I mean I think all of us “ketocooks” are pretty amazing if I do so say myself, but you take it to a whole new level! Thank you! Merry Christmas! That could not be any cuter. I think I have 1 more holiday baking project, and it’s a great chance to try out the buttercream frosting recipe. Thanks Dawn! It sure made Charlotte happy! Keep in mind that you can use the frosting on just about anything.. you don’t even have to make gingerbread. Hope you all have a wonderful Christmas! How pretty…I’m sure Charlotte is thrilled!